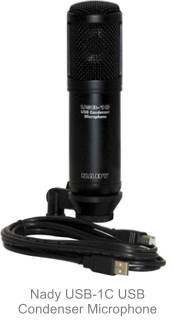 USB Microphones can offer a quick & easy solution to your studio microphone needs. The biggest upside is that these have the mic preamps, analog to digital converters, and phantom power (in the case of a USB condenser mic) all taken care of in one package. But before choosing one of these for your home recording studio, it's important to have an understanding of the drawbacks as well. Like any microphone, the sound waves must be converted from a pressure wave to an electrical analog signal and finally to a digital signal before your Digital Audio Workstation will be able to record them. The built-in Analog-to-Digital Converters will almost certainly be leaving something to be desired from this conversion process. Every bit of quality lost during this process will travel all the way downstream to your final recording. Now if you're in the business of pod casting or something similar you can use these with no problem. A human voice when speaking has much less dynamic and frequency range than a singing voice or a stringed instrument. The bigger problem is that unless they have built in gain controls, there is no way to know how much headroom you have to spare before clipping and distortion set in. In other words, it's very possible to have your levels set wrong with no way to adjust them. For those lucky enough to have avoided digital clipping and distortion thus far... rejoice! It is a most unpleasant experience. Unlike in a system with mic preamps where the gain and levels can be set precisely) this style of mic will leave you in the dark. Also the price is very alluring because these are far cheaper than an Audio Interface & Dynamic/Condenser Mic combo. In my experience people have quickly become disappointed with their newly bought USB microphones and then have to go crawling back to buy a dedicated interface anyway. Only now they're also out the money it cost to buy the USB mic, so the budget is certainly going in the wrong direction here. The good news is that if you are looking for a very quick and inexpensive solution for recording, podcasting, voice over work, etc. then this type of microphone will be able to get that work done. So after all that arm waving and explanation, here's what it comes down to. You will get a better sound and have more precise control of the inputs to your recording system when you have traditional microphones such as the Dynamic or Condenser mic. I guess, in the end, it comes down to expectation management. If you're expecting a crystal clear representation you'll be disappointed, but if you're just looking to get something on the air or onto a streaming radio show, etc. then these may work for you. The main selling point is that they are very easy to get setup, but the truth is proper studio mics and an audio interface are also easy to setup. If you are looking to record music at home then do yourself a favor and avoid these at all costs.